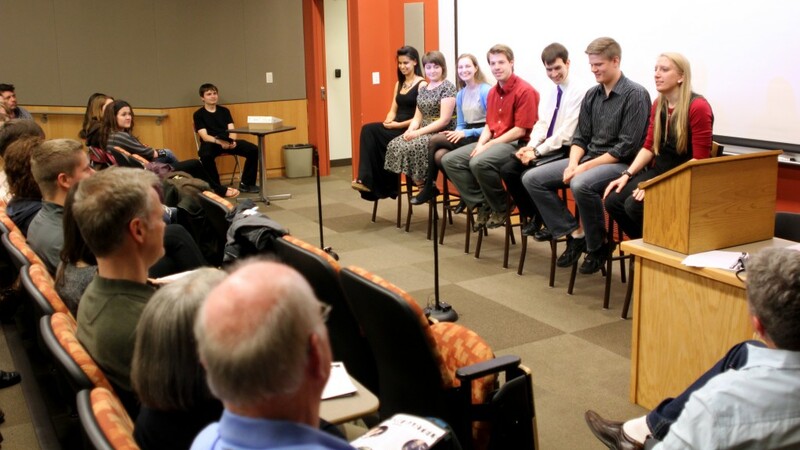 It was a full house with overflow seating as the seven media arts seniors presented their capstone projects this spring. The projects are the culmination of a semester (or two) of collaboration with classmates, friends, and real world clients. The students presented a variety of work including music videos, interactive design, a tutorial series, and a study of 3D modeling software. Here’s a quick overview of the showcase. Matthew Fraser and Rebecca Alberts decided to make a game for Android phones. They spent the last academic year learning the ins and outs of game design, including working with Unity, a popular software development kit for games. Aimee Bruss spent the last two semesters doing a deep dive into Cinema 4D, a software package for 3D modeling and animation. She created a series of images using Cinema4D to increase her familiarity and proficiency with the program. She also generated the title sequence for the capstone showcase and assisted with animation for the Speechless Film Festival promo. Olivia Lee and Leah Kurth directed a music video for the song I’m On Your Side by Florida-based singer-songwriter Matt Hires. The video combines live action with hand drawn animation to tell a sweet and simple story. They worked with Matt in the studio and assembled a team of supporting animators to complete the project. In 2014-15 Benjamin Weber was the production engineer for the Maverick Hockey Weekend broadcast. For his capstone project, he used his knowledge of the production truck to create a user manual and several tutorial videos to train in students who are new to the broadcast. Jon Bartels created a music video for his band Party After Paradise using their original song Higher. His final piece is a humorous video highly reminiscent of the classic music video style—it follows the band on their way to perform the song at a concert. The students put together a video presentation of all their projects, and we hope to be able to release it soon (we are unable to post it publicly until we have an OK from the bands). As soon as we can share it, we’ll post it on the blog, so stay tuned!